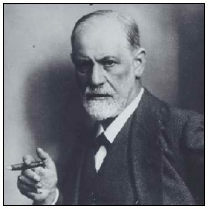 An association called Friends of the Goat was formed, which said a Freud monument could be placed anywhere, while “a statue of a goat can only be situated on Goat Square”. Traffic tickets? Probably just slipped their minds. Eight of the 15 candidates running for three nominations to be a traffic court judge in the May 15 Democratic primary in Philadelphia owe parking fines and three of them owe more than $1,000 each. Today is the anniversary of the arrival of the first Pony Express rider at Sacramento, California. Although it looms large in Western folklore the Express only ran for about a year and a half from April 1860 to October 1861. The ad above is from a California newspaper of the time. Presumably similar ads ran in Missouri. 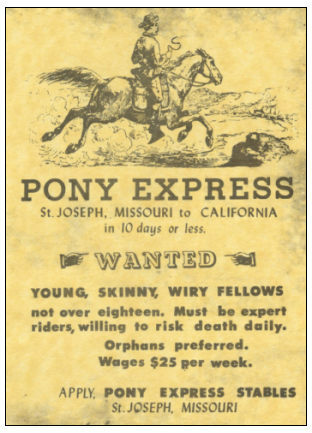 Contrary to the ad most of the riders were older than 18 and not orphans. One hundred eighty three men in all rode for the Express. The youngest, known as Bronco Charlie, was only eleven years old. I don’t know about other places but there is at least one place in Nevada, near Virginia City, where you can still clearly see the groove the horses hooves left in the dirt.